Most company's standard pools include a simple timer mounted on a wood post outside by the filter. The only way to turn on the spa, fire up the heater, or turn on the filter pump is by walking to the equipment area and manually flipping a switch and turning a bunch of cryptic valves. Over the years, Monogram has won awards for our home automation systems. We have taken that same knowledge of home automation and transferred it to our swimming pools. Your pool filter pump, spa (if you have one), pool lights, waterfall pump, etc. can all be controlled from inside your house and also programmed to turn on and off when you want them to. 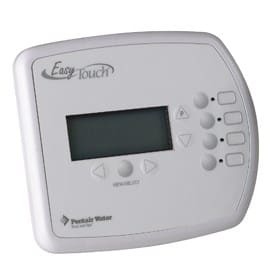 The Pentair Easy touch system is on our Standard+ and Ultimate pools. 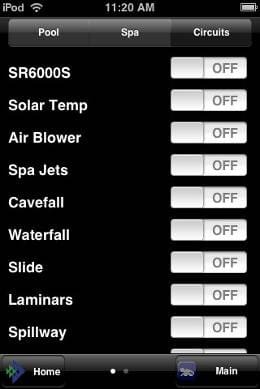 Every Monogram automation package on pools with spas includes the Pentair Spa Command Remote Control, which gives you FULL control over your spa while relaxing and getting a therapeutic massage. 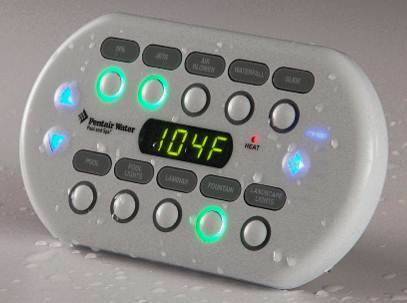 There basically is nothing on your pool/spa that can't be controlled from this remote! There truly is no automation system that comes as close to making pool ownership as "Hassle Free" as the Pentair ScreenLogic 2 with remote monitoring does. Pentair allows you to control your pool even if your internet connection is down. Some competitors' systems REQUIRE an internet connection and are slow to respond. And because of their year 2000 era 802.11b wireless protocol, your entire wireless internet connection in your house slows down significantly! Screenlogic connects locally, so if your internet connection is down you can still control your pool. Pentair's Screenlogic has also been in use for over 5 years and is a 2nd generation, proven and tested product. Monogram has been instrumental in the development and implementation of the Pentair screenlogic control. We have been a consultant for over 6 years for Pentair and possess the technical ability to ensure that the automation control works flawlessly. As of January 1, 2012, Pentair has thousands and thousands of Screenlogic 2 systems installed and working flawlessly. Jandy/Zodiac only released their iPhone control in 2012...so it is very new, and not field proven. We ONLY use proven Pentair. Don't end up being a guinea pig with a non proven automation system installed by a builder that doesn't have extensive technical experience. 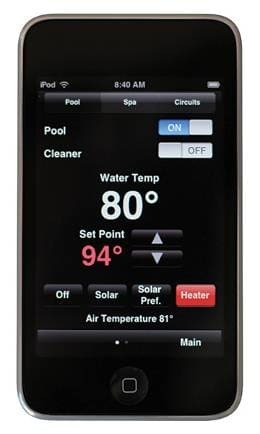 Be sure to ask your builder for references for their iPhone controlled pools. As of 2013, Monogram is the ONLY builder to have installed this type of remote monitored automation in the Lehigh Valley. Imagine having dinner at Melt...or Pizza hut®...or even breakfast in bed at your home...and pulling out your iPhone® and turning on your spa so it is fired up and ready. Or turning on the waterfall or your pool lights! It can also be done from an iPod touch (with wifi), iPad (wifi or 3g), or ANY PC IN THE WORLD connected to the internet or to your local network. 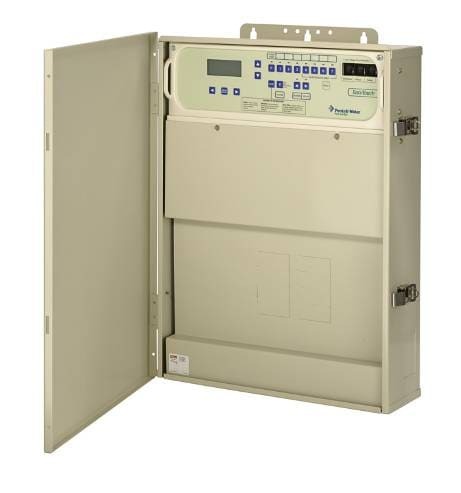 In addition, the Ultimate+ Screenlogic system allows Monogram to remotely monitor ALL aspects of your pool including pH, Salt, Chlorine, Temperature, pump usage and system errors.